My current project is training Fletch to feel comfortable in a harness and on a leash so we can take him with us to faire. That’s the plan. Fletch, however, is decidedly undecided about the entire endeavor. 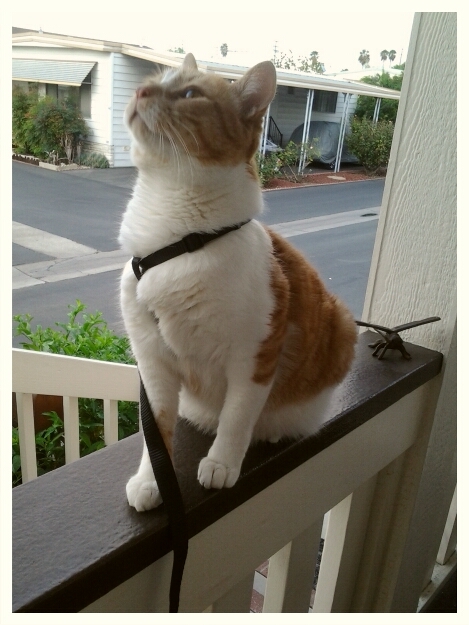 He doesn’t mind being in the harness, thanks to treats and patience. Being outside is sort of okay, too, but just barely. Put Mr. Kitty down on the sidewalk and he loses all confidence. He turns into a wimpy cat, barely moving, almost crawling/slinking his way closer to me. Treats don’t help quite as well when he’s on the sidewalk. Thankfully, we have time to get him used to the idea of being outdoors, on a leash, and dealing with the myriad of scents and sounds. God willing, Fletch will soon be a great little travel buddy. I spun out a few times and thought I was going to roll the car a couple times. I was only going 30mph. It’s scary. I told her to slow down. Whatever she thinks is a safe speed, she should reduce by at least 5mph. I remember my early days of driving in snow while living in Colorado. I’m sure I pissed off a lot of my fellow drivers by going as slow as I did, but I was determined not to have an accident! I did well. I managed to avoid all the dangers of snow and ice… until I had Mojo. There was the day I’d just dropped her off at day care when I slid through an intersection, up into a driveway, and bumped into a parked car. No damage to either vehicle, but plenty of damage to my nerves. And then there was the morning I was driving her to the hospital for surgery. She was having tubes placed in her ears. We were on the freeway and a small patch of black ice caused the car to slide right into the back end of another car. Thankfully the was no damage to either auto, but I felt so horrible knowing how much worse it could have been for us. The very idea that Mojo could have been injured was enough for me to start thinking about moving back to California. Hmm ow my baby girl is all grown up and facing snow and ice on her own. I don’t think I like that! But there’s nothing I can do other than pray for her safety and tell her to slow down. Little Dude is 19 now. One-nine. How on earth is this possible? Didn’t I just give birth to this kid? All I know is he’s the kind of kid any parent would be proud to have. He’s kind, thoughtful, sweet, smart, creative, and funny. I think he was destined to be a gentle soul. I totally won the kid lottery with him. So much of his life is still ahead of him and I’m looking forward to seeing what comes next.